Review by AllTheBestFights.com: 2016-03-05, some good single shots between Luis Ortiz and Tony Thompson but it is not enough to get three stars: it gets two. The undefeated interim Wba champion Luis Ortiz entered this fight with a perfect boxing record of 24-0-0 (21 KOs=87%) and he is ranked as the No.6 heavyweight in the world (currently the #1 in this division is Tyson Fury). ‘King Kong’ Ortiz fought three times last year beating Byron Polley (=Ortiz vs Polley), Matias Ariel Vidondo (=Ortiz vs Vidondo) and Bryant Jennings (=Jennings vs Ortiz). His opponent, the 44-year-old Tony Thompson (8 years older than Ortiz), has an official record of 40-6-0 (27 knockouts) and he entered as the No.14 in the same weight class. He fought twice in 2015 winning over Odlanier Solis (=Solis vs Thompson 2) but then he lost to Malik Scott (=Thompson vs Scott). 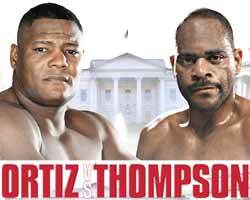 Ortiz vs Thompson is the main event of the evening. Watch the video and rate this fight!